We do not know where objects originate; we just assume that they exist. We do not know where the center of Euclidean space is. The center of Projective Space is the heart of each object or being. A point has no size or is empty. A point can be a star of infinite lines or planes. An object consists of empty points. An object or being consists of infinite lines or planes. Parallel lines meet at Infinity. Geometrical figures consist of finite points, lines or planes. Geometrical figures consist of infinite lines or planes. Geometrical figures are static or dead. Geometrical figures are dynamic or alive. What do you see in the image on the right? Perhaps a circle? Yes, a circle but this circle does not consist of points in Euclidean Space. It is the result of infinite lines projected in Projective Space. 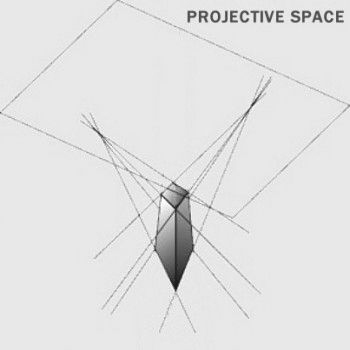 What is Projective Space? It is the space of Projective Geometry. Mathematicians know that the Euclidean Geometry of distances, measurement and angles is just a particular aspect of a more Universal or Projective Geometry. This geometry deals with pure relationships. In Projective Geometry, distance, size and angles are irrelevant. The only properties that are preserved under projective transformation are incidence and anharmonic ratio. The anharmonic or cross-ratio is the ratio of ratios. The cross-ratio preserves the relationship between inside and outside points, outer space and inner space. And so we think we live in the three-dimensional space of Euclidean Geometry but we really are in the wondrous space of Projective Geometry. Although the infinite lines of projective space are invisible to our sight; they are perceivable with our mind. Projective space includes both the realm of material bodies as well as the metaphysical realm of mind or spirit. 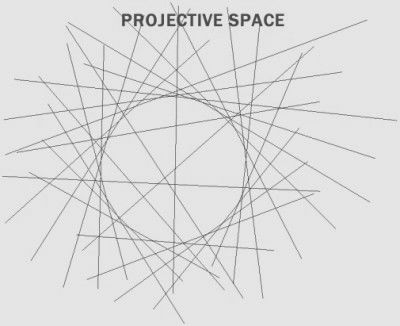 I will now use some of the properties of projective space to show how they can change our ideas and beliefs about the universe. For example, what is interesting and important to understand about this circle is that, if you did not know what the concept of a circle were, you would not have seen the circle: You would just have perceived a bunch of lines. 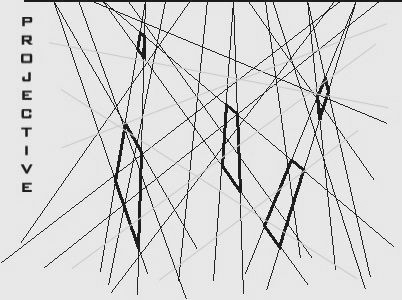 If it were a geometrical figure unknown to you, you would have just seen a cluster of tangled lines. What does this mean? It means that we really see with our mind or understanding, not with our physical sight. It is not what we see that matters; it is our understanding of what we see. Two persons may witness the same physical event but each person will interpret it according to his understanding. Even physicists have concluded that a quantum or the smallest physical particle only exists if it is perceived by consciousness. Otherwise, there is only a quantum soup of possibilities. Unlike in Euclidean Geometry, the elements of projective geometry are all infinite, perfectly straight and perfectly flat. But these infinite lines and planes can generate finite forms like the circle. And these lines and planes are all projected from infinity. In Euclidean geometry, we only have a vague concept of infinity but, in projective geometry, infinity must always be taken into account. And so, from projective geometry, we know where finite objects and beings originate: they are projected from the ideals at infinity. The infinite lines and planes can move but the ideals at infinity are fixed and eternal. If Infinity represents God, then we can say that every being that is in the three-dimensional universe is projected from the spiritual ideals at infinity or Heaven. And God is in Heaven. In projective space, we are compelled to acknowledge God because we can see that every thing in the universe, including our own self emanates from Him. Take away the projected lines and the circle disappears. Its existence is completely dependent upon the lines that are projected from Infinity. Swedenborg says that human beings are just vessels or recipients of Love and Wisdom. And all Love and Wisdom emanates from God. In the three dimensional world, we seem separated both physically and mentally. Every person has his own personal body as well as his own opinions, beliefs, thoughts, desires and feelings. 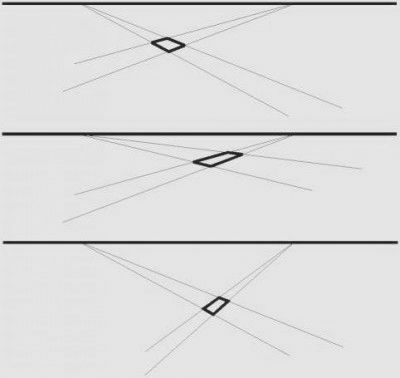 The most separated things in Euclidean space are parallel lines or planes because an axiom of Euclidean geometry is that parallel lines never meet. How should we interpret this? Parallel lines represent persons that have completely different beliefs, thoughts and emotions, those who cannot understand or love each other. But an axiom or Truth of Projective space is that parallel lines and planes meet at Infinity. This means that, in reality, we are all united in Divine Love and Truth at Infinity. Some persons may consider themselves enemies but God sees them as friends who have yet to understand each other and the Truth. In Euclidean geometry, geometrical figures are fixed or dead. For example, a rectangle has finite sides which never move. But, in projective geometry, figures are alive. For example, the projected quadrangle on the right can change form. The quadrangle has feelings and thoughts; it can be symmetrical or asymmetrical depending on its mood. But its soul is represented by the four lines projected from the two fixed points at Infinity. Let us translate this geometrical language into meaningful thoughts. The body of the quadrangle is the finite polygon. This body can be seen in Euclidean space. Its soul are the infinite lines projected from infinity; its soul is invisible in Euclidean space. Its soul is alive; the infinite lines can move around. When they move, the body changes. This means that its soul is in correspondence with its body. In fact, its body is simply a manifestation of its soul in the material world of Euclidean space. If the body moves, it is because the soul has moved emotionally. If the body has a smile on its face, it is because the soul is joyful. If it has a frown on its face, it is because the soul is in a negative state. It is no coincidence that the words "motion" and "emotion" have the same etymological root. We move in the natural world and we move in the spiritual world. Natural motion is a change of place and spiritual emotion is a change of state. We can be in the same place with somebody in the natural world but be millions of miles (states) apart in the spiritual world. What does it mean to be moved by something? It means that we have been taken to a different state in the spiritual world. If the quadrangle's body is a function of its soul, then, when the body is sick, it simply means that the soul is spiritually ill. In order to heal its body, it must heal its soul or change its beliefs, intentions, thoughts and emotions. If it wants its body to be harmonious and organized, its loves and beliefs must conform to the ideals at Infinity. When the soul is healed, the body is healed. Since the body is a manifestation of the soul, natural illness is a manifestation of spiritual illness. But spiritual illness may not only be caused by our own transgressions; it can also be caused by the sins of our ancestors, which we carry within our own being. We must untangle all these lines and planes if we desire to be healthy. There are still two points to consider. What do the two fixed points at Infinity represent? The quadrangle's soul is connected to Infinity or God by means of the points at infinity. These points represent the quadrangle's destiny or true purpose in the universe. Its destiny is always with God. In fact, it is by means of these points of destiny that the quadrangle was created. And, by Divine Providence, God is always guiding the quadrangle by means of the points at Infinity. The quadrangle may not be conscious of this Truth. It can see its body in Euclidean space and, through its soul, it knows that it can feel and think. Sometimes it asks itself: " What are all these thoughts and emotions? Are they real like my body?" But we can see in Projective space that its soul is more real than its body; it is its soul that is manifesting its body. Its body is only a manifestation of its beliefs, thoughts and emotions. But its soul is projected from the points at Infinity; its soul is attempting to manifest its destiny. Its destiny is part of the Divine Plan. The quadrangle is probably ignorant of this Truth; it may erroneously believe that it is just a body in Euclidean space, that its mind is just the electrical impulses in its brain and that emotions are just hormones in its blood. After all, this is what scientists and doctors have said. But we can see that the most important element of the quadrangle's being are the infinite lines projected from the two fixed points at Infinity. Unlike, its finite body, its soul and destiny are infinite and eternal. Life would be easy to understand if we were like this quadrangle, alone with God in projective space. We would simply obey our spiritual will and be in Heavenly Peace and Joy. Unfortunately, the lines and planes of our soul are entangled with the lines and planes of all other beings in the universe and this whole entanglement obstructs our connection and communication with our true spirit. In general, the lines and planes of our soul must be entangled with those who have similar loves and beliefs. And our soul must be influenced by the places in spiritual space that correspond to our beliefs, desires, thoughts and emotions. If we want a life that is in tune with our true destiny, we need to align our beliefs, wishes, thoughts and emotions with God's Truth. And we must behave in accordance with these new beliefs and loves. We are not our body; we are what we love and what we believe. As we can see, our true will and destiny are just a part of God's Truth. If we consider the omnipresent and unified reality of projective space as representing a higher Truth, then we must consider Euclidean space and time as illusions or lies. In projective space, there is neither space, nor time; there are only omnipresent states of mind. In Euclidean space, things seem deceptively simple because we think we are isolated from others and the world; we think that our mind is secluded and personal. But this is an illusion or a lie. Deep inside, we may be depressed, confused and perplexed. This is because, in reality, our lines and planes of thought and emotion are entangled with other planes in spiritual space. For example. we are still tied to the planes of our ancestors. All the thoughts, beliefs and emotions of the past are still there in spiritual space and we are tied to them. We are tied to all mankind for better or worse. Most of us are also still tied to the false beliefs, ideas and feelings of our particular culture or ethnicity. We are also closely tied to the emotions and thoughts of our friends, our immediate family, our neighbors, the citizens of our town, the members of our national society and all human spirits on Earth, in Heaven and in hell. In addition, whenever we act against our conscience or true self, we increasingly entangle our lines and planes with darker spiritual realms and our soul loses its connection with the Peaceful and Joyous realms of Heaven. Where are Heaven and hell in spiritual space? Heaven is where the ideals of Divine Order are located. But the hells are certain places in spiritual space where the lines and planes are in disorder. These human hells were not created by God; they were created by selfish human beings throughout the ages. These disordered lines and planes are disassociated from the Order of Heaven; they represent selfish or evil desires, false beliefs and ideas. Each hell corresponds to a certain kind of moral disorder. If we are arrogant, resentful, lustful, cruel, violent, greedy, egotistical or vain, our lines of thought and emotion automatically entangle themselves to the corresponding hell. As we have just discovered, the present reality of our situation in spiritual space is not very harmonious. But we cannot run away from the Truth. We must untangle and harmonize all these lines and planes by means of Love, Wisdom, repentance, forgveness and understanding. Now, Swedenborg says that those who love the Lord and others more than themselves are in correspondence with Heaven, while those who love themselves and the world are in correspondence with hell. Let us see if this concurs with our model of projective space. Those who believe and love God are those who acknowledge the Truth of projective space. They understand that their very being is being projected from Infinity in projective space. Those who believe and love their own self are those who only believe in the illusions or lies of Euclidean space. They falsely believe that their thoughts and emotions originate from the empty points of their physical body In Euclidean space. Those who love others more than themselves understand that the lines and planes of their being are part of the Divine Order of humanity whose ideal is at Infinity or in Heaven. Those who love the world are those who erroneously believe that what is valuable are the empty points of Euclidean space. They erroneously think that their mind and heart are personal and that they are masters of their own self. But, as we can see, what is valuable are the infinite lines and planes of Love and Wisdom as well as the Divine Truth and Good at Infinity. A person who lives in spiritual Light understands that his own welfare and destiny are tied to the lines and planes of humanity and the Divine Order of Heaven. Those who only believe in themselves and the world live in the spiritual darkness of Euclidean space; they are ignorant of projective space. Instead of being connected to the Divine Order of Heaven, the lines and planes of their soul are entangled with those of some infernal society in projective space that corresponds to their perverted loves and false beliefs. We know that the space or world where our physical body resides is not two-dimensional like the quadrangle; our physical space is three-dimensional like the projected three-dimensional cube on the right. And, beyond physical space is the fourth dimension of our life or Time. And what about the state of our soul? Where do our beliefs and loves reside? Our beliefs must reside in the fifth dimension and our real loves in the sixth dimension. We are not projected from an ideal line at Infinity, nor from a plane at infinity but from God’s higher-dimensional Love and Wisdom. Heaven consists of higher-dimensional states of Love and Wisdom. The whole universe is breathing or reconciling the empty point of matter and the Ideal Infinite. In our three-dimensional world this gives rise to all the different forms that we see around us. This includes galaxies, stars, planets, humans, animals, vegetables and minerals. But we must remember that these are just three-dimensional phenomena of higher dimensional realities. This means that all these forms must resemble the Ideal at infinity because it is at Infinity where the archetypes or Ideals are located. In the Bible, it says that man was created in the image and likeness of God. Therefore the human form is not an accident of natural selection; it is the shape of Divine Order or Heaven. In fact, while he was conscious in the higher spiritual worlds or Heaven, Swedenborg noticed that everything was in the form of a human being. Angels and societies of angels were in the form of a human being. When he inquired about this, he was informed that Heaven was in the order or form of Divine Truth, Divine Order or the Divine Human. Later, he discovered that the substance of Heaven was Divine Good or Love and its form was Divine Truth, Divine Wisdom or the Divine Human. This means that our own human body is organized in the form of Heaven, the Divine Human or Divine Truth. And we have the potential to manifest Divine Truth on Earth. A natural form may be physical but a spiritual form is a state of consciousness. But this state is more real than matter because it consists of the eternal substance of Love. In fact, our feelings are derived from the eternal substance of Love and our thoughts are derived from the form of Love or Truth. Truth is Divine Form, Intelligence or information. It appears that the universe reconciles the void of primordial matter and the infinite greatness of ideal Spirit [Good or Love]. The Divine Human reconciles the infinite and the finite, God (Divine Love) and man. It is interesting that, in projective geometry, the conic sections (circle, ellipse, parabola, hyperbola) reconcile the point and the line at infinity. We can see that these conic sections resemble a human being. 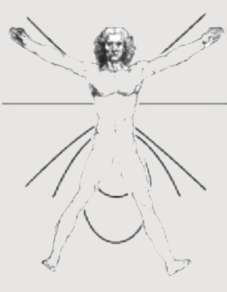 The arms and legs coincide with the arms of the hyperbola. The foci are at the head and reproductive organs, while the heart coincides with infinity. How the universe reconciles spirit and matter is explored in an article on fractals.